Hey! I’m Giving Away a Fuzzy Nation ARC! 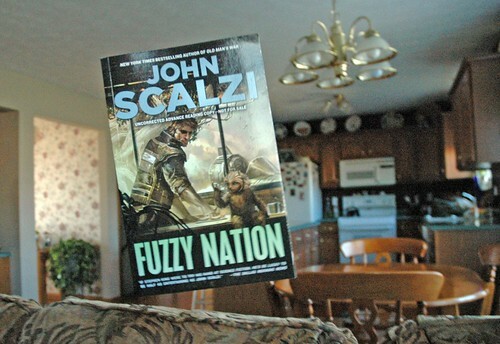 Specifically, this Fuzzy Nation ARC, which as you can see is apparently eerily hovering above my couch. No, it’s not Photoshopped. I just turned off the gravity in the house for a minute. What? You don’t have gravity control in your house? Well, talk to your gravity provider about that, folks. I can’t do everything for you. Tell me why you deserve this Fuzzy Nation ARC. And make it good, because I want to be entertained by your story of deservation. In fact, for the purposes of this contest, it’s more important that you entertain me than tell me the absolute truth. I’m not saying you have to lie, mind you — if you’re so awesome in your day to day life that you can come up with a reason why you deserve this ARC without resorting to outright fabrication, why, that’s all to the good. But if you aren’t that awesome, well, go ahead and fudge a little. Or a lot. Yeah, better make it a lot. Put your tale of deservedosity in the comment thread to this entry. You will have until 11:59pm (eastern) on Sunday, November 28, 2010 to do so. Enter only once (which another reason to make your tale a good one). After that, our panel of judges, consisting probably of me, my wife and one of the cats, will decide who walks off with the levitating Fuzzy Nation ARC (note: not guaranteed to levitate where you are). I’ll even sign it to you or to whomever you choose and then hand it off to my wife so it will actually get mailed in time for most seasonal holidays. So: Your stories of total deserveosity! Give them to me! Now! Good luck. I don’t even want to think about what the bathroom in that house looked like two hours after dinner. Share something with us that you’ve never shared here before. Well, see. Typically if I’m not sharing something, it’s because I have a reason for not sharing it, like: I signed an NDA. Or: It’s none of your business. Or: I’m not ready to tell you yet. Or: It’s something so boring that you would fall asleep as I told you. And in all those cases I’m perfectly fine not telling you those things. I think you’d appreciate my restraint. I am a secret best-selling poet. True fact: The Sagan Diary was composed entirely in free verse. Then, when I was done writing the whole thing, I went back and formatted it into traditionally formed sentences and paragraphs, so as not to scare away the sort of reader who freaks out when presented with poetry not in the form of song lyrics. 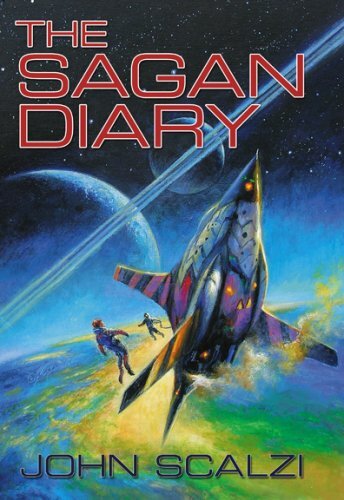 Be that as it may, The Sagan Diary is a poem, and when you read it knowing that, this fact becomes fairly obvious. Since TSD came out, about four years ago now, it’s sold about 8,000 copies. This a very healthy amount for a 12,000-word novelette in hardcover format, but it’s also a fairly impressive amount for a modern book of original poetry aimed at adults. Or would be, had I claimed it as poetry before this moment, which I have not (well, I’ve mentioned it to people before, but haven’t written about it). So, big “secret” reveal aside, I don’t make any real claim to being a best-selling poet. And to be clear, even if I had claimed it as poetry, this would not be dispositive regarding the quality of TSD as poetry. When one remembers that one of the most successful modern books of poetry, sales-wise, erupted forth from Jewel, one remembers that sales do not directly equate with quality. I think TSD works perfectly well as a piece of writing, myself, and writing it in that format got me into an “internal monologue” mindset, which is what the story needed to have. Does it work as poetry? It’s an interesting question and I’ll let other people answer it. So that’s today’s big secret.